Being the head of a creature essentially without spine, and, even more to the point, with vague form, must be something of a challenge. Part of the failing of the United Nations probably lies in its disparate existence, a scattered composition of bureaucratic entities that, when they come together, supply a perfect picture of inertia. (Perhaps for the best: a more active UN could well lead to a deeper muddying of waters.) Such an arrangement invariably leads to one conclusion: The organisation tends to mimic the power order of the day, compliant to the great states, malleable to their capriciousness. What matters on the day is what is legitimised. Kofi Annan’s time as Secretary General of the UN reflected the post-Cold War realignments of power. But unlike his predecessor, the oft prickly Boutros Boutros-Ghali, who gave the hagiographers little to go on, he cut a fine figure for fandom. He was soft-spoken, rarely got irate, proved so diplomatic as to reveal little. Certain works on Annan’s legacy have been flattering to the point of crawling. James Traub’s The Best Intentions (2007) gushes, telling readers of the “big smile and a roundhouse handshake”, “the gentle, kindly African with the silver goatee and the rueful, yellowing eyes”. Traub’s description of Annan was much like that of an infatuated groupie with eyes popping, enthused by a man who had made the UN office of Secretary General his own. “Kofi and [his wife] Nane, both enormously attractive and disarmingly modest, the one short and black the other tall and blonde, made for a dazzling couple: they projected a kind of moral glamour” (sic). That he appealed in company and proved pleasing to the eye hardly armours him against criticism. 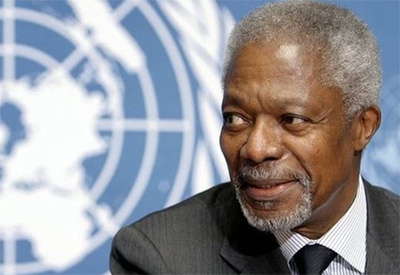 Annan presided over the UN during a time when the US imperium had lost any viable, containing foe, with no rivals to ruffle feathers; and it was an imperium that took a shining to the Ghanaian diplomat in encouraging his rise to the post of Secretary General in 1997. His amenability to US influence began early. The Ford Foundation noted him as an appropriate convert while still in Ghana, after which he found himself studying economics in Minnesota. The Carnegie Foundation then took an interest, sending him to a graduate institute in Geneva. The academic stripes were never earned, and Annan found himself on the bureaucratic track starting at the World Health Organisation. On the way, he snacked on doctrines of managerialism at MIT’s Sloan School of Management. It is worth noting that his time in the UN was very much passed as that of a bureaucrat ever keen to avoid anything disruptive. Stints in budgetary positions tend to have that effect. The call of power had to be heeded, and he wasn’t the one doing the calling. Those close to him soon realised how comfortable he felt with keeping the Washington line. His stint as chief of UN peacekeeping operations was marked by a few noteworthy moments that do not fit the hagiographer’s script. On receiving a desperate cable from Canada’s Lieutenant General Roméo Dallaire, in charge of UN forces in Rwanda in January 1994, Annan stonewalled with coolness. Daillaire’s request that he be given permission to raid Hutu arms caches as an effort to frustrate an unfolding genocide against the Tutsi population was fobbed off, an unnecessary deployment of UN resources. Diligently civil servant-like, Annan kept the Security Council in the dark as the corpses mounted. Praise, in the absence of analysis, has been effusive. Forbes called him the father of modern corporate sustainability. “A great son of Africa and a true global leader has passed away.” Other tributes on his legacy have been trite, admitting to the limits of diplomacy while suggesting he did change the order of global politics. He, explained an uncritical John J. Stremlau of the Carter Centre, “knew the UN system and its strengths and limitations better than anyone.” Despite his sketchy record when involved in the peacekeeping side of things, he would tell African leaders in 1997 that “human rights are African rights” and that, while the continent deserved external assistance, ultimate responsibility fell to its leaders. Others also attempt to pad out an essentially skimpy outline of actual changes that took place under his watch. Ignatieff offers a range that reads like resume enhancement without due evaluation: the UN Global Compact, the Millennium Development Goals, the Global AIDS Fund, the International Criminal Court, and that most troubling of notions, the “responsibility to protect”, which has merely been shown to be another variant of the traditional “right” to meddle. To that, Ignatieff might have added UN non-reform. The totality of Annan’s leadership was the totality of conversation and chairmanship, the activity of the meeting room, which can be confused with effective governance and the making of policy. Founding the Alliance for a Green Revolution in Africa, or being the chairman of Elders, founded by Nelson Mandela, can surely no more or less prestigious than any post-employment shoe-in, the gravy train rendered respectable? Such moves are designed less to change the world than profit from it. But that was his consummate skill: to seduce counterparts, woo detractors and court the public spectacle even as others made policy. Truly an appropriate winner, along with the organisation he represented chocked with its failures and mild successes, of the Nobel Peace Prize in 2001.